The Association of Independent Authors (AiA) is a non-profit organization formed 1 January 2010 and launched 1 February 2010. In 2008, for the first time in history, more books were self-published than those published traditionally. This growth will continue, enabled as it has been by advancing technologies and a new way of thinking about an old subject, hence the change of phrase from "self-published" to "independent author". There are a number of forums and social networks for writers, but none, until now, that are focused specifically on the issues facing independent authors. Independent authors are also businesspeople—authorpreneurs, who need to understand all aspects of the publishing process, as well as the essentials of writing. Our mission is to create a culture of excellence, teamwork and professionalism in a community environment where sharing and collaboration benefits each individual member and independent authors as a whole. I'm hoping we can get a group formed in the Tulsa, OK, area. If you're a self-published author or thinking of self-publishing, please join us! How many projects do you work on at one time? I'm feeling a bit overwhelmed right now. I have so many writing projects that I want to do. I'm working on a children's fiction book, a nonfiction Oklahoma History curriculum, and a fiction mystery/romance, as well as keeping up with my Web site, marketing my books, and writing blogs, books and iPhone reviews and newsletters. Where does my time go? How do you prioritize and schedule your writing time? For the past two months, I've been exploring writer's groups. I've joined three: Society of Children's Book Writers and Illustrators, American Christian Fiction Writers, and Oklahoma's Writer's Federation, Inc. I've also joined the local affiliates of these organizations including SCBWI-OK, WIN, and Tulsa Night Writers. I've also signed up to attend the SCBWI conference in OKC where I'll have my first fiction children's book critiqued. In the process of all this, I've met many wonderful, local authors. You'll see some of them sprinkled throughout my posts. They have been encouraging as well as inspirational. If you're thinking about become a writer, I highly recommend that you get involved in some writer's groups. This has inspired me to actually put the pen to the paper. I've thought about writing fiction for years, but never did it. Attending group meetings and workshops, as well as meeting local authors who have published, has given me the inspiration I needed to get started. How about you? I actually started my first novel, today. Yesterday, I read Janet Evanovich's book, How I Write. It inspired me to actually begin writing words to that book I've been wanting to write. So, today, I wrote 296 words. Evanovich said in her book to start with one paragraph and work towards a page a day (about 250 words). I feel good that I wrote 296 words. Basically, I set the plot, outlined some of the characters, and set the scene. Maybe I can do this? Fun new app for Writers! I just reviewed the Oxford American Writer's Thesaurus app for the iPhone. Both the hardback book and the iPhone app are excellent resources for writers, but the app is a lot easier to use and to carry! You can see my review on the iPhone Life Magazine Web site. Linda Fulkerson will present a workshop on "Using Free Online Tools to Promote Your Message" at the March 20, 2010, meeting. Time: Noon - 4 p.m. at the White County Regional Library, 113 E. Pleasure, Searcy, Arkansas. For more info, see the Arkansas Inspy Writers Web site. My husband and I just purchased a Wii Fit Plus. Although, I also work out at Gold's Gym, I'm finding that this gadget is great for my off days. I especially love the strength training and Yoga. But, my favorite is the bicycling activity. I LOVE THIS ONE! It feels like I am riding a bike in a hologram or something. When I ride by the waterfalls, I heard the falls; when I ride by the windmills, I hear them turning; when I ride by the ocean, I hear the waves breaking on the land. It's very relaxing and fun to do. It takes a lot longer to work off the calories than at the gym, but the time passes quickly because I get so engrossed in the scenery! Now, I'm going to order Walk it Out. I've read a lot of good reviews about this one. I'll let you know. This book changed my life. After reading Half Time, I was inspired to finish my college degree (See Empty Nest Mom Goes to College) and then become a freelance writer. I just discovered that CBD is having a sale on this book - only $3.99 until Thursday, Feb. 11th. If you're looking for inspiration on what to do with the rest of your life, you need to read this book. Today, the Writer Magazine and Gotham Writers Workshop announced The Writer's 2010 Short-Story Contest. Your story must be original fiction and no more than 2,000 words. The deadline to submit your story is May 31, 2010. Third Place: $200 AND MORE! To enter or read more information, check the Writer Web site. Nelson’s Complete Book of Bible Maps and Charts is a combination Bible Atlas and Bible Commentary. It is organized to take the reader, book by book through the Bible using maps, charts, and graphs. Perfect for the visual reader! The book is divided by Testament and further divided by books in each Testament. The Old Testament begins with an overview chart of famous people, important events, contemporary culture information and the date that each book was written. The Old Testament is further divided into five sections: Pentateuch, Historical Books, wisdom Literature, Prophetic Books and the Intertestamental Period. Each of these sections includes an introduction, a chronology of events, and a brief commentary. Each book in a section includes information on the author of the book, a short overview of the contents, an outline of the book, and a commentary on the contents of the book. Full-color maps and charts provide additional information. For example, in Genesis, there are maps illustrating the geography of the Middle East, the route Abraham traveled from Ur to Egypt, and the location of the nations located in Genesis. A variety of charts and diagrams contrast the two Adams, compare the ages of the Patriarchs, illustrate the spiritual decline during the generations following Abraham’s, and reveal common sayings that originated from Genesis. The New Testament is arranged into three sections: The Four Gospels, The Epistles of Paul, and The General Epistles. In each book, there are charts that provide additional information such as an overview of each book, dreams and visions in the New Testament, and a list of the twelve apostles and in which book each was mentioned. Photos take the reader to the Sea of Galilee, the Roman Road in Corinth, the ruins of Caesarea, and other places relevant to this time and place. A variety of maps show the Roman Empire during the time of Jesus, the missionary trips of Paul, and the location of the seven churches in Revelations. This is not a complete commentary, and serious students of the Bible will need a more substantial resource. However, for those who are interested in an overview of the Bible, this is an excellent resource. It’s easy to read, colorful and interesting. Do Writer's Make a Living? 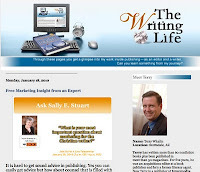 Last week, I participated in a Webinar hosted by Terry Whalin in which the host interviewed Sally Stuart, author of the Christian Writer’s Market Guide. I asked the question, “Do writers really make any money today? How many books do you need to write to make a living?” Her answer was, “A lot. It’s very difficult to make a living as a freelance writer.” She went on to say that she knows writers that have 8-10 to a dozen books in print and can’t make a living. She also said that most writers have to supplement their income by editing, tutoring, or teaching seminars and conferences. As a self-published author, who is trying to break into the traditionally published market, this is a bit disconcerting! However, it also helped me decide to manage my time better. I don’t really want to publish my own fiction, but since it’s probably not going to be a big money maker, I will have to spend more time working on my nonfiction to keep the money rolling in. Does anyone with experience in both self-publishing and traditional publishing have any suggestions for those of us who are thinking of going the traditional route? JUST OUT! The Spring 2010 issue of iPhone Life Magazine at your favorite bookstore. Read my selections for Best Apps Ever in this issue! You can read my other iPhone app reviews on the iPhone Life Web site. Article on Author's Guild says that Macmillan is raising royalty rates on e-books to 25%.